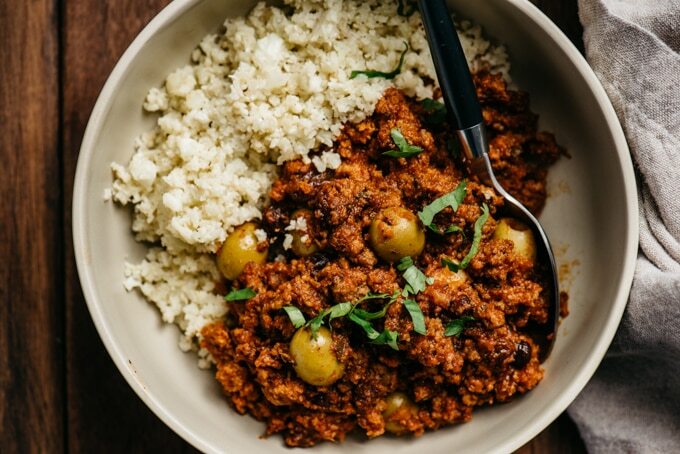 This classic picadillo recipe is a comforting combination of seasoned ground beef, spicy tomato sauce, sweet raisins, and briny olives. The flavors meld into an irresistible hash that’s ready in just 35 minutes. You’ll be scrambling to make this weeknight comfort food as often as your family will allow! >>> Pin it now! Click here to save this Picadillo Recipe to your weeknight dinners board on Pinterest. 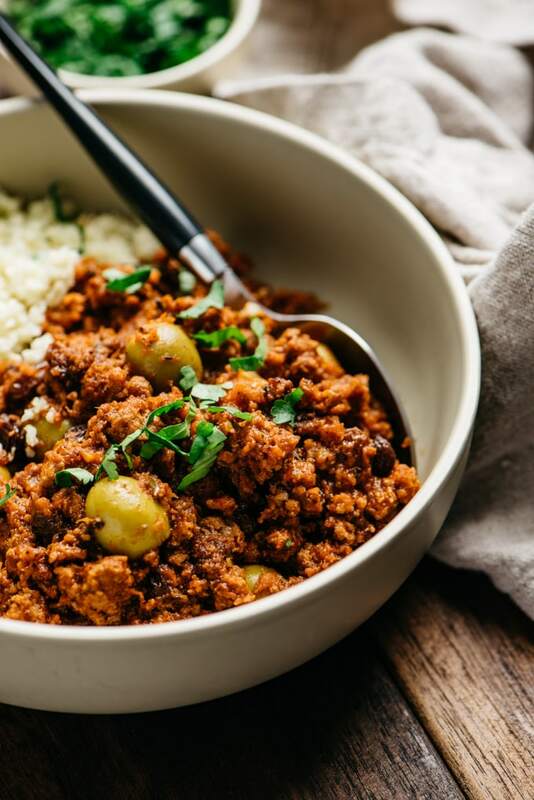 Picadillo is to Latin American cuisine as Sloppy Joes are to American cuisine – cozy, comforting, and ready in a flash. But truthfully? Picadillo is way better. So. Much. Better. 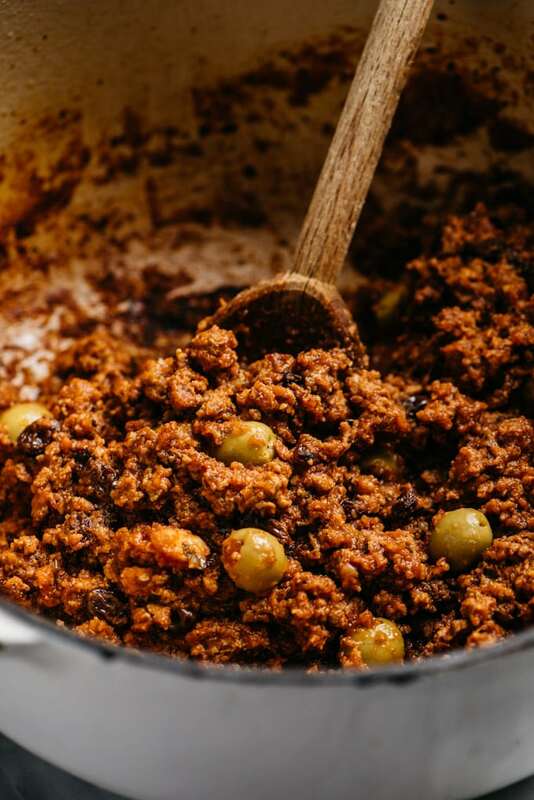 Picadillo is a ground beef hash-style recipe made with tomatoes, raisins, and olives. I know, I know, it sounds a little…weird. But trust that weird is so good! The sweet juicy raisins and briny olives are the perfect contrast to each other folded into seasoned beef simmered with tomatoes and warming spices. It’s truly a recipe you need to taste to believe. The best part is that you can become a believer in just 35 minutes, and this recipe is made using 90% pantry stash ingredients. It’s the flavor-packed, economical dinner recipe you need in your rotation. Can I get a huzzah?!? 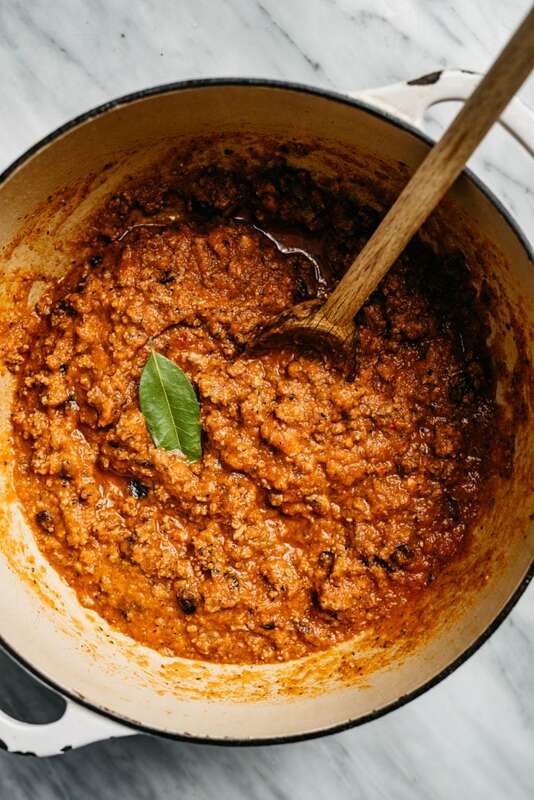 Like most homestyle comfort foods, there are a million and one ways to make picadillo. Some call for oven roasted tomatoes, some call for a sofrito base, some add capers or chili powder. 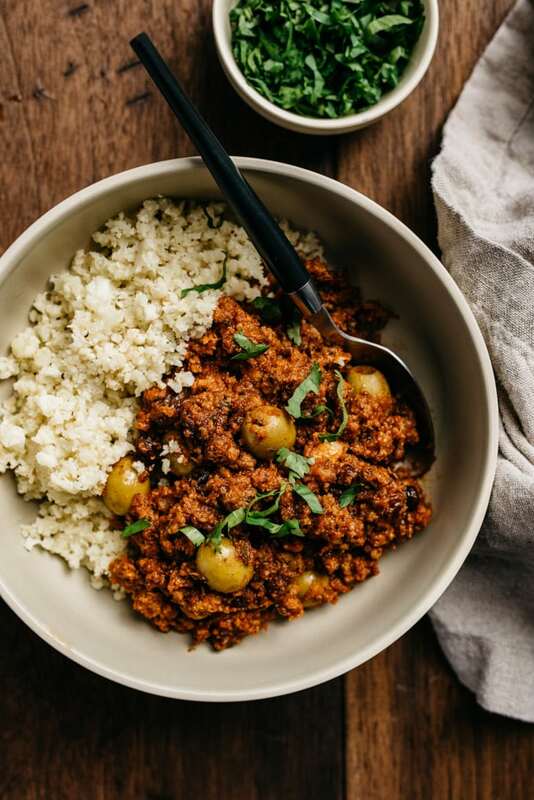 I’ve adapted this picadillo recipe from several variations over the years into a fast and kid-friendly weeknight dinner that my family loves. I keep the prep time low by blending a spicy tomato sauce using canned fire-roasted tomatoes. They’re a quick way to add depth and flavor without any extra work. Make the spicy tomato sauce. In a blender, combine a quartered medium onion, three smashed garlic cloves, a chopped jalapeno, and a 14.5-oz can of fire roasted tomatoes. Blend on high until the vegetables are pulverized and the sauce is smooth. Add extra kick to your sauce by keeping all or most of the jalapeno seeds. My kids can’t handle the heat, so I leave most of them out. Brown and season the beef. Heat a dutch oven over medium high heat, add a splash of olive oil and a pound of ground beef, and cook until the beef is no longer pink. Break up the beef into small pieces using a wooden spoon. Once browned, add seasoning (cumin, oregano, a pinch of cinnamon, salt and pepper) for flavor and tomato paste for depth. You’ll also add a quarter cup of raisins in this step, which will become plump and juicy as the picadillo simmers. The raisins and olives are an unexpected but outstanding combo, so don’t skimp or skip! Add the tomato sauce and simmer. Pour the tomato sauce into the ground beef, and give everything a good stir. Top with a bay leaf, then cover and simmer until the sauce turns deep red and the aroma makes you salivate (about 20 minutes). Add the olives and olive brine. Last step! Toss in a handful of pimento-stuffed olives and a tablespoon or two of olive brine. Start with one tablespoon of brine, taste the picadillo, then add more if you feel it needs more pucker. You’re looking for a nice balance of sweet, sour, and spice between the raisins, olives, and beef. Garnish and serve. 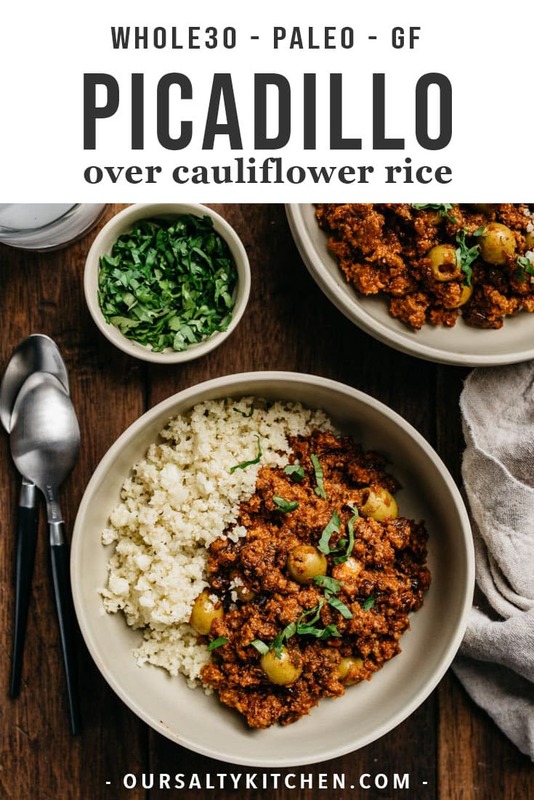 Serve this picadillo recipe over white rice, or cauliflower rice to keep it Whole30 or low carb. Garnish with cilantro to bring another bright, herby layer to this complex, but oh-so-easy, weeknight dinner. You can also stuff picadillo into empanadas or tortillas, or serve for breakfast with a fried egg. Double-duty leftovers are the best! Picadillo keeps in the fridge in a tightly sealed container for up to 5 days. Freeze this recipe by stopping the preparation after you’ve completely Step 4. Store in an airtight container in the freezer for up to 3 months. Defrost, then gently reheat over medium high heat and add the olives and brine before serving. 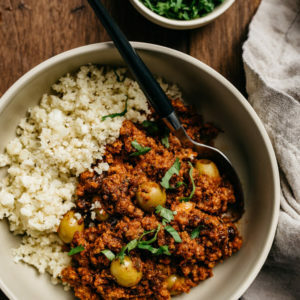 DID YOU MAKE THIS PICADILLO RECIPE? I WANT TO SEE YOUR CREATIONS! SNAP A PICTURE AND SHARE IT HERE ON PINTEREST. 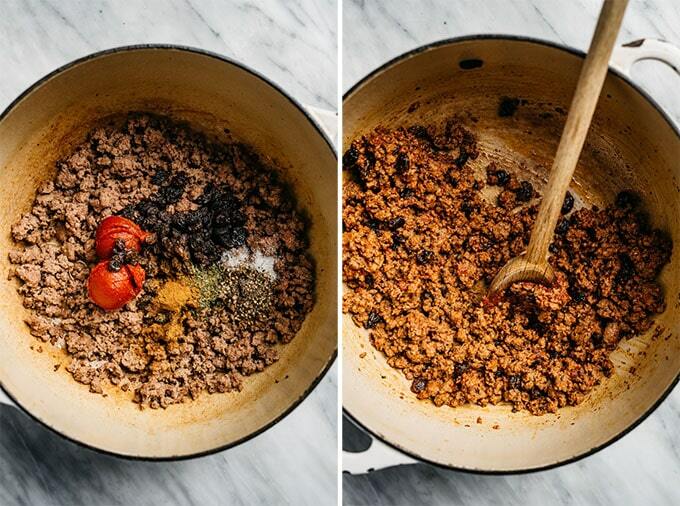 Like most homestyle comfort foods, there are a million and one ways to make picadillo. Some call for oven roasted tomatoes, some call for a sofrito base, some add capers or chili powder. 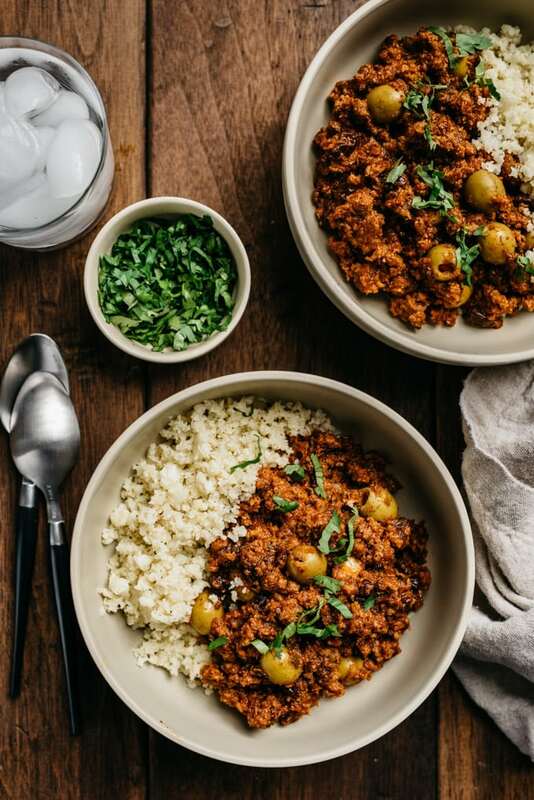 I've adapted this picadillo recipe from several variations over the years into a fast and kid-friendly weeknight dinner that my family loves. I keep the prep time low by blending a spicy tomato sauce using canned fire-roasted tomatoes. They're a quick way to add depth and flavor without any extra work. 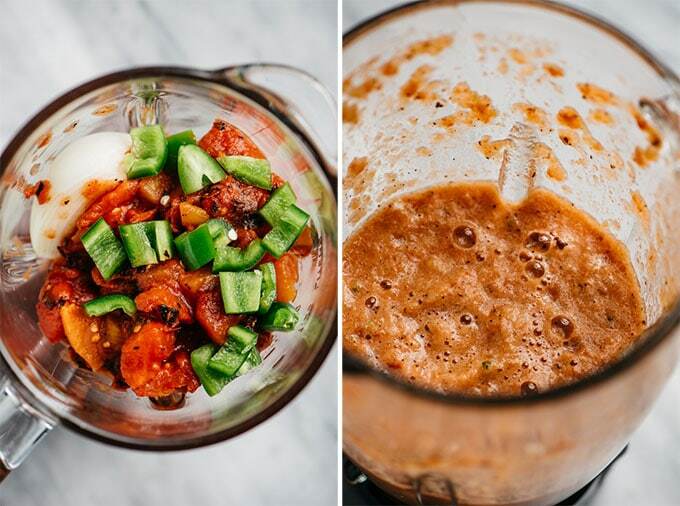 Place the onion, tomatoes, jalapeno, garlic, and apple cider vinegar in a blender. Blend on high until pulverized and smooth. Heat a dutch oven over medium high heat. Add the olive oil and heat until shimmering. Add the beef and cook until no longer pink, breaking into small pieces with a wooden spoon, 4-5 minuets. Add the raisins, tomato paste, cumin, oregano, salt, and pepper. Stir until the tomato paste and seasonings are incorporated into the beef. Pour in the tomato puree, add the bay leaf, and stir. Cover, reduce heat to medium and simmer 20 minutes, stirring occasionally to prevent the bottom of the pot from scorching. Stir in the olives and 1-2 tbsp olive brine. Simmer until the olives are heated through, 2-3 additional minutes. Serve over rice or cauliflower rice and garnish with fresh chopped cilantro. The picadillo isn't overly spicy as written. To add heat, keep some of the jalapeno seeds and/or add 1/2 - 1 tsp chili powder in step 3. This was really yummy! I have always made picadillo in the slow cooker all day so this was a great idea to have the same flavors but in an easy week-night version. Served over cauliflower rice, the whole family loved it!